Intel has officially unveiled their full line-up of Skylake sixth-generation Core processors today, spanning a range of product categories from performance desktops to low-power compute sticks. As is typically the case for Intel's consumer-focused launches, the company hasn't yet divulged model numbers or specifications for all of their Skylake products. Instead Intel is speaking more broadly about their new CPUs and what they'll bring for consumers. Starting at the lower end of the power scale, Intel's Skylake-Y series will be available for 2-in-1 detachables, tablets and compute sticks in a 4.5W package. The company is expanding their Core M branding for these Y-series parts to include several variants, the Core m7, m5 and m3, which will sit at various levels of performance and cost. Interestingly, Intel is no longer targeting their Core m parts for ultra-portable laptops, instead focusing purely on fanless tablets and compute sticks. With Broadwell we saw a few thin and light laptops, such as Lenovo's Yoga 3 Pro and the 2015 MacBook, opt for Core M parts over Broadwell-U, but with Skylake we expect most laptops to feature the more powerful U-series SKUs. 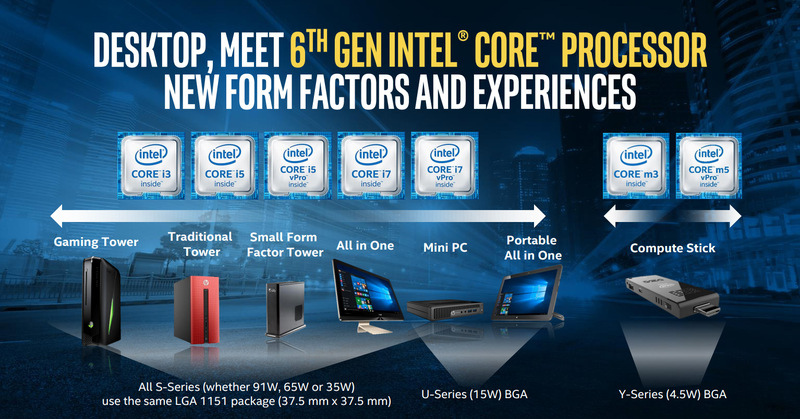 Speaking of Skylake-U, this is Intel's range of 15W CPUs for thin and light notebooks, portable all-in-ones, and mini-PCs. Leaked slides have already detailed these processors, so we know the Core i7-6600U (2 cores, 4 threads at up to 3.4 GHz) will be the flagship part, with the Core i5-6200U (2 cores, 4 threads at up to 2.8 GHz) likely to be the most widely used SKU. All Core-branded Skylake-U parts will feature Intel's 500-series HD Graphics, specifically the HD Graphics 520, which Intel claims will deliver 30x the graphics performance of their equivalent mobile CPUs from five years ago. On the CPU side, Intel is reporting 2.5x the performance from the Core i5-6200U compared to the Core i5-520UM from early 2010, as well as 3x the battery life in thinner and lighter products. 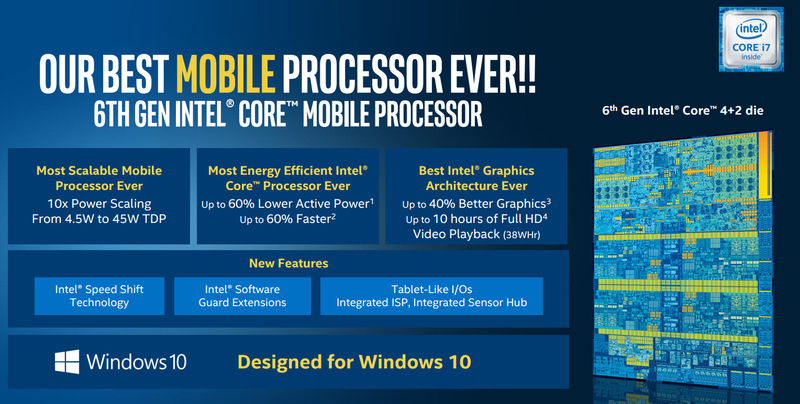 Intel is calling their Skylake-H CPUs, designed for performance notebooks, their best mobile processor ever. These SKUs feature a TDP up to 45W, which is a slight decrease on the equivalent 47W Haswell and Broadwell parts, with better power consumption and better performance. Specifically, Intel says the Core i5-6300HQ is up to 60% faster than the equivalent 37W Haswell-based Core i5-4300M, while the Core i7-6920HQ has up to "60% lower active power" than the high-end Core i7-4910HQ. 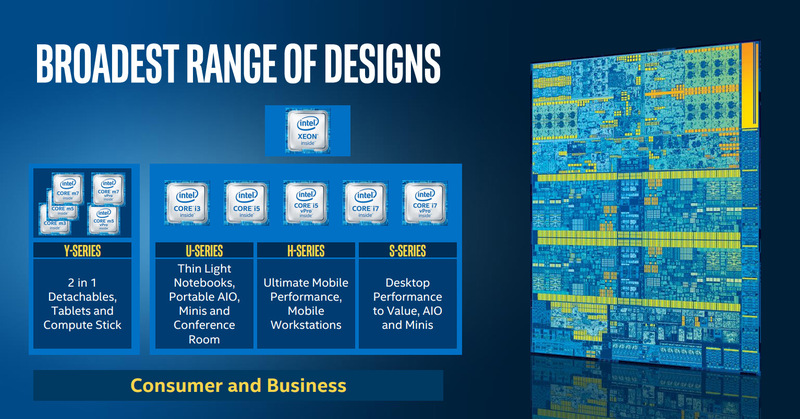 For desktops, Intel has the Skylake-S series, covering all price points from budget builds to performance systems. All S-series parts use Intel's LGA 1151 package, and feature TDPs of 91W, 65W, or 35W depending on the part. Two of these SKUs, the Core i7-6700K and Core i5-6600K, we've already seen hit the market, but there will be more S-series parts hitting the market shortly, including non-K SKUs. Intel's Skylake-U, H and S parts in their Core i3, i5 and i7 lines have all launched today, alongside the Skylake-Y Core m3, m5 and m7 parts, meaning it won't be too long before we see these SKUs hit store shelves either in boxes (for Skylake-S) or integrated into new products. Intel's other Skylake products - Xeon (inlcuding Xeon for notebooks), vPro Core i and Core m products, and CPUs with Iris and Iris Pro graphics - are expected to launch in "Q4 and into 2016".